Who governs? 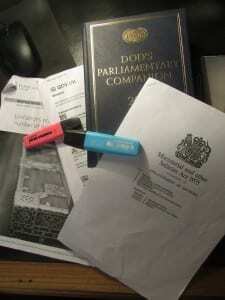 Knowing your Secretary of State from your Parliamentary Private Secretary | Who Runs Britain? If one were to ask a random selection of the public on any high street in the UK, who they think runs the country, while the answers would be varied and perhaps laced with a healthy dose of scepticism about whether anyone was steering the ship at the moment, it is likely that a large proportion of people would offer answers including the Prime Minister, the Cabinet or the Government. If asked who occupied those positions, while most could probably name the Prime Minister and perhaps a handful of Cabinet Ministers, although probably no more than that, it seems doubtful that many would have a clear idea about who makes up the Government or indeed about how many people this comprises. Any confusion is understandable. With the exception of the Prime Minister, even the most senior offices of state can vary over time. Some ministerial positions come into and out of existence with increasing regularity, while others are more than a little obscure. Few, I suspect, know the difference between a Parliamentary Under-Secretary and a Parliamentary Private Secretary, although to those occupying these positions the difference is clear and important. Nevertheless, the positions which make up the Government and also the number of people holding these positions is a matter of public record, and is, in some respects, defined by law. It does not constitute every MP in the governing party; but is perhaps larger than many people realise and extends some way beyond those who sit around the Cabinet table with Theresa May. The Prime Minister sits at the head of the Government. The Prime Minister is, in general, the leader of the largest party in the House of Commons. Following a general election, the leader of the largest party in the Commons is invited by the Queen to form a government. If no party commands an overall majority in the House of Commons, by winning more than half of seats, the incumbent Prime Minister will be given the first opportunity to form a government. For example, following the 2010 general election in which no party won a majority of seats, Gordon Brown remained as Prime Minister while talks took place between the three main parties over who would form a government. Only when it became clear that he would be unable to form a coalition government or govern as a minority party, did Gordon Brown resign as Prime Minister, leaving the way open for the Queen to invite David Cameron to form a government and become Prime Minister. Although the Prime Minister is the most powerful minister in the government, their powers are significantly constrained by the need to retain the support first of their Cabinet and of parliament. The Deputy-Prime Minister or First Secretary of State. There is no constitutional requirement, or indeed expectation, that Prime Ministers in the UK appoint a deputy. In the period since the second world war Britain has not had a Deputy Prime Minister more often it has had one, although in recent years the office has been occupied for long periods. Most notably by John Prescott, who served for ten years as Deputy Prime Minister under the Tony Blair, and the Liberal Democrat leader, Nick Clegg held the post for five years as part of the coalition agreement. Prime Ministers have also, on occasion, appointed a senior Cabinet minister as First Secretary of State. This is an honorary position, which implies the holder is more senior than other Cabinet ministers, and has often, but not always, been held concurrently by the Deputy Prime Minister. Crucially, however, neither the Deputy Prime Minister or First Secretary have any particular statutory powers and they do not attract a higher salary than that for other Secretaries of State. The existence of both roles is at the discretion of the Prime Minister. The current Prime Minister, Theresa May, has not appointed a Deputy Prime Minster or a First Secretary of State. Once the Prime Minister has been appointed he or she is expected to form a Cabinet. This is comprised of the most senior Ministers in the Government. Ministers who run government departments are known as ‘Secretary of State’. Although not every department has a Secretary of State at its head, the most important departments, such as the Home Office, the Foreign Office, Ministry of Defence and the Departments of Health & Social Care, Transport and Education, are all led by a Secretary of State who sits in the Cabinet. There are currently 18 Secretaries of State in the Cabinet. Secretaries of State are powerful Ministers with considerable resources at their disposal which can, in some respects, make them more powerful than the Prime Minister. A Secretary of State sits at the head of a team of Ministers and can also draw upon the administrative resources of their own department. In contrast the Prime Minister does not have a government department or a ministerial team at their disposal. The Prime Minister does head the Cabinet, but once Cabinet ministers return to their own department they are masters in their own domain. The Prime Minister can invite whoever they like to join the Cabinet, as long as they are members of the House of Commons or the House of Lords, and Cabinet ministers do not all run Government Departments or hold the title of Secretary of State. The Chancellor of the Exchequer is to all intents and purposes, including salary, the Secretary of State for the Treasury. The second most senior Minister in the Treasury, the Chief Secretary to the Treasury, has also often been a Cabinet minister, although this is not currently the case. The Leaders of the House of Commons and the House of Lords are also, usually, Cabinet ministers, although at the moment only the Leader of the Lords is a permanent member of the Cabinet. The Prime Minister may also choose to appoint other ministers to the Cabinet, perhaps as a means of bolstering their support around the Cabinet table. David Lidington, Minister for the Cabinet Office who also holds the honorary title, Chancellor of the Duchy of Lancaster, is Deputy Prime Minister in all but name. He sits beside the Prime Minister in Cabinet and often deputises for her at PMQs. The size of the Cabinet is limited by legislation to 21 members, excluding the Lord Chancellor, a post which is now combined with that of Secretary of State for Justice. There are, however, currently 23 members of the Cabinet. As we shall see, while there are statutory limitations on the number of ministerial salaries, the ministerial ranks have been padded out at all levels by the addition of unpaid ministerial appointments. The unpaid member of the current Cabinet is Brandon Lewis, the Chairman of the Conservative Party, who has the rank of Minister of State. While the size of the Cabinet is limited by law other Ministers can be invited to attend Cabinet meetings, as and when they are needed. There are currently 6 Ministers listed as also attending Cabinet, these include the Chief Secretary to the Treasury, Leader of the House of Commons, Attorney General and the Chief Whip. Interestingly, with the exception of Attorney-General, these are all positions which have in the recent past been full-Cabinet posts. They have been moved out of the Cabinet in part to allow for the appointment of new Secretaries of State responsible for the two departments handling Britain’s exit from the European Union: the Department for Exiting the EU and the Department of International Trade. Crucially, however, and no matter how often they attend Cabinet, Ministers ‘also attending’ Cabinet are not Cabinet ministers and are not paid the same salary as a Cabinet minister. This is significant, in particular when one considers the gender balance in the Cabinet. Theresa May was criticised for the reduction in the number of women in her Cabinet following the 2017 general election. There are currently 5 women in the Cabinet including the Prime Minister, compared to 8 immediately before the 2017 election. In response to this criticism, it has been argued that that the total number of women attending Cabinet has actually increased, due to the fact that 4 of the 6 Ministers ‘also attending’ Cabinet are women. However, having women in positions which may involve the same work and responsibility as Cabinet ministers, but which do not attract the same status or salary, is contributing to a gender pay gap at the heart of government. There are a large number of other ministerial posts below the level of Cabinet minister. Each Secretary of State can draw on a team of junior ministers comprised of members of the House of Commons or the House of Lords. These are generally known as junior Ministers although a distinction should be made between Ministers of State and Parliamentary Under-Secretaries of State. Ministers of State are the next rung down the ministerial ladder from Secretary of State. There are usually three or more Ministers of State in each government department. Ministers of State are powerful and may be very experienced ministers with considerable responsibility. They usually have individual responsibility for particular policy areas, and this varies depending on how departments are organised. The Foreign and Commonwealth Office for example, currently has four Ministers of State responsible for different geographical areas: Europe and the Americas; the Middle East; Asia and the Pacific; and Africa, as well as one Minister of State responsible for the Commonwealth and the UN. The Home Office has four Ministers of State with different functional briefs based on the work of the department: immigration; security and economic crime; policing and the fire service; and countering extremism. The Minister of State for Immigration, Caroline Nokes, also attends Cabinet, because immigration is considered to be a particularly important issue at this time. The Ministerial and other Salaries Act, 1975, caps the number of paid ministerial posts, although it does allow for some differentiation between ministers at different levels. The total number of paid ministerial posts at the Minister of State level and above must not exceed 50. If there are 22 Cabinet ministers, including the Lord Chancellor, this leaves 28 other paid Ministerial posts. There are in fact currently 33 Ministers of State, across both Houses. This is achieved by having 5 unpaid Ministers of State. Parliamentary Under-Secretaries of State are the most junior Ministerial rank. There are usually one or more Parliamentary Under-Secretaries in each Ministerial team but the balance between Ministers of State and Parliamentary Under-Secretaries varies from department to department. The Foreign and Commonwealth Office currently has no Parliamentary Under-Secretaries and the Home Office has only one. In contrast, the Ministerial team in the Ministry of Defence comprises a Secretary of State, two Ministers of State and two Parliamentary Under-Secretaries. Like Ministers of State, Parliamentary Under-Secretaries may be given responsibility for particular policy areas, although they often have a much broader brief covering a range of issues or activities and generally have less personal responsibility for the development of policy. They are more junior and often less experienced Ministers and their decision-making powers are usually more constrained than those of Ministers of State. Parliamentary Under-Secretaries would be expected to consult before making any significant policy changes or announcements. Ministerial teams provide a thin layer of political direction in each government department and may be crucial in helping Secretaries of State to steer the administrative machine. They also have a crucial parliamentary function. Departmental questions take place each sitting day in the House of Commons, on a rotating basis. This means that each government department will be subject to an hour of parliamentary questions about their work, every five weeks or so. On these occasions, while the Secretary of State will clearly play a leading role, questions are usually answered by different members of the ministerial team depending on the subject. Working in this way, effectively as a tag-team, can help to reduce the parliamentary pressure on individual ministers and the Secretary of State in particular. One member of each ministerial team is usually a member of the House of Lords. This is because the government needs Ministers to be able to answer questions and make statements in the Lords as well as the Commons. However, because there is usually only one member of the House of Lords in each ministerial team, Ministers in the Lords do not enjoy the parliamentary comfort blanket of a team of ministerial colleagues when answering question on the floor of the House and can appear somewhat isolated. As with Ministers of State the number of paid positions as Parliamentary Secretary is dependent on the number of ministerial appointments at other levels. The total number of Cabinet Ministers, Ministers of State and other Ministers including Parliamentary Secretaries must not exceed 83. If the maximum number of 50 Cabinet Ministers and Ministers of State are appointed, then the total number of Parliamentary Secretaries should be 33. There are currently 35 Parliamentary Under-Secretaries, 2 of whom are unpaid for their role. There are 3 law officers, these are legal advisors to the government who are also parliamentarians. The Attorney-General for England and Wales is the Government’s principal legal advisor. The Attorney-General is assisted in this role by the Solicitor-General. These are both political appointments held by Members of Parliament, albeit individuals who usually have a background in the law. By convention these are not Cabinet posts, in order to avoid a conflict of interest between those making political decisions and those offering advice on the legality of those decisions. They may, nonetheless, be asked to attend Cabinet if their advice is being sought. Since 1999 following the devolution of justice matters to the new Scottish Parliament, a new department was created in Whitehall, the Office of the Advocate General for Scotland, and a new ministerial position of Advocate General for Scotland was created. The post is currently held by a member of the House of Lords and is combined with the post of Ministry of Justice spokesperson in the House of Lords. Although their role is primarily to ensure party discipline, party whips are paid members of the government. There are in fact quite a lot of whips and they are assigned a range of obscure and largely honorary titles which enable them to be paid for their work. Five government whips in the House of Commons are paid as Junior Lords of the Treasury, they are supported by 7 assistant whips, who are somewhat more helpfully titled, assistant whips. There are 4 more whips in the Commons, including the Chief Whip and 3 others who go under the respective titles of Treasurer, Comptroller and Vice Chamberlain of Her Majesty’s Household. The Chief Whip and Deputy Chief Whip in the House of Lords enjoy the even more ostentatious honorary titles of Captain of the Honourable Corps of Gentlemen at Arms and Captain of the Queen’s Bodyguard of the Yeoman of the Guard. Somewhat bizarrely while government whips in the Commons go under the title of Junior Lords of the Treasury, whips in the House of Lords, who are full members of the House, are known as Baronesses and Lords in Waiting. The Ministerial and other Salaries Act allows for 22 paid whips (excluding the Chief Whip who is paid as a Parliamentary Secretary): 16 in the House of Commons and 7 in the House of Lords. However, as with Ministerial posts there are a number of unpaid whips which means the number of whips across both Houses is currently 26. The bottom rung of the ministerial ladder is occupied by the Parliamentary Private Secretaries (PPS). These are unpaid ministerial aides. The role of the PPS is to support ministers in carrying out their role. They rarely get the opportunity to speak in Parliament, or indeed the media, and are not expected to answer questions, but can often be seen sitting behind ministers in Parliament, from where they can provide information and support. Most government departments have two PPSs. One is usually assigned to support the Secretary of State, while the second has a more general responsibility to support the ministerial team, although a small number of Ministers of State also have their own PPS. Although they are not paid a ministerial salary, PPSs are expected to support the government in the same way that a Minister would. If a PPS wishes to challenge the government by speaking out publicly or voting against government policy in parliament, they would be expected to resign their position. In doing so they would forgo the possibility of elevation to ministerial ranks. There has been a significant increase in the number of Parliamentary Private Secretaries in recent years, leading to accusations that governments are seeking to pack the House with guaranteed supporters by offering the prospect of ministerial office later. Although these are unpaid positions, when combined with the massed ranks of paid ministers these are usually known as the ‘payroll vote’. According to the latest list, which was published in September 2018, there are currently 46 Parliamentary Private Secretaries. So how big is the government? As should by now be clear, government is comprised of a large number of people, and there are more government posts than appear to be allowed for by legislation. This is because the legislation dealing with the number of ministerial appointments is primarily based on an assessment of the acceptable number of ministerial salaries which can be paid, rather than any notion about the acceptable size of the government. The Ministerial and Other Salaries Act 1975, limits the number of paid ministerial posts, including whips to 109, across both Houses. The House of Commons Disqualification Act 1975, provides that not more than 95 minsters may sit and vote in the House of Commons, but there is no limit for the House of Lords. There are currently 120 individuals occupying posts as ministers and whips across both Houses, 95 in the House of Commons and 25 in the House of Lords. This is achieved by creating unpaid ministerial posts of which there are currently 11: 6 in the House of Lords and 5 in the Commons, this is two more than when the government was formed following the 2017 general election. The situation is further complicated by the fact that there are in fact 138 separate posts for ministers and whips. This is because, at all levels, there are individuals occupying more than one role. In some cases, ministerial responsibilities are combined with other parliamentary roles. Ministers in the House of Lords for example, usually combine a specific ministerial brief with the role House of Lords spokesperson for their entire department, while five government whips in the Commons also hold ministerial posts. Other individuals carry two full ministerial roles, Penny Mordaunt for example, combines the role of Secretary of State for International Development with that of Minister for Women and Equalities. She is assisted in this by Victoria Atkins who is Minister for Women and a Parliamentary Under-Secretary in the Home Office with responsibility for crime, safeguarding and vulnerability. Similarly, the recent announcement of a new Minister for Suicide Prevention, did not involve the appointment of a new minister but was added to the portfolio of Jackie Doyle-Price who already holds the position of Parliamentary Under-Secretary for Mental Health and Inequalities. Once again it is unfortunate that so many of these combined roles, in which individuals carry out two jobs for one salary, are held by woman. With 120 individuals holding government posts as ministers and whips in percentage terms the May government is now larger than any government since 1979, and quite possibly than at any point in history. This is all the more remarkable when one considers that Theresa May has fewer MPs on which to draw than any Prime Minister since 1979. When the 46 Parliamentary Private Secretaries are added to the 95 Ministers and Whips in the House of Commons there are 141 Conservative members of the House of Commons currently holding government posts. This amounts to 45% of MPs on the Conservative benches and 22% of the total number of MPs elected to the House of Commons. This central core of loyal MPs, who would need to resign their position in order to vote against the government, is of course vital if one is seeking to govern without a majority. This entry was posted in Uncategorized and tagged Executive, May, Parliament, payroll vote, PPS. Bookmark the permalink.